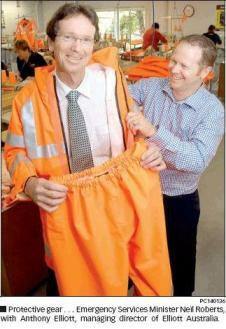 The Minister for Emergency Services Neil Roberts visited Elliott Australia to see first hand where and how the new SES Breathable Wet Weather Trousers are made. Elliott Australia have been making the QLD SES Wet Weather jackets for some years now and the addition of the trousers completes the ensemble. Elliott Australia Managing Director, Anthony Elliott said it was a pleasure to show off the highly technical manufacturing abilities of a Queensland who has been manufacturing protective clothing for over 40 years.
" It's great to see the QLD Governments commitment to local manufacturing" Mr Elliott said.